It would be completely forgivable to mistake Liv’s Intrigue for Giant’s Trance. Yet while the two bikes’ silhouettes are nearly indecipherable, the Inrigue’s geometry is, in fact, ladies-specific and completely different from the Trance’s. 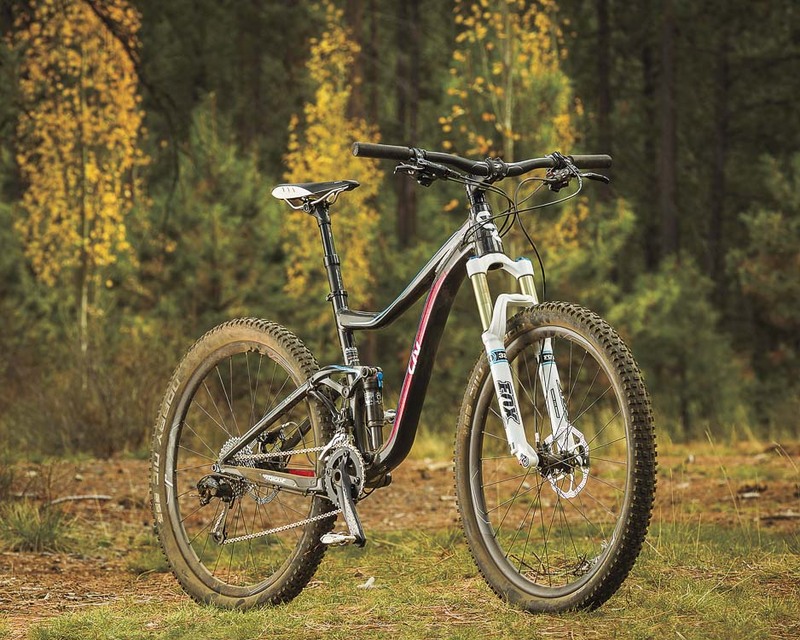 Like it’s Giant-branded male counterpart, this 140-millimeter ripper features Maestro suspension and is intended for trail riding. Under the right pilot, though, it’s also a capable machine when things get chunky. Watch the video to see how the Intrigue performed on some of Oregon’s finest singetrack. In its first year as a standalone brand, Liv barely tweaked its mountain bike line, sticking with the range of three 27.5-inch-wheeled performance bikes it launched for model year 2014 under its parent company, Giant Bicycles. The Intrigue 1 5.5-inch-travel bike did get some smart upgrades for this year, including SRAM's Guide R brakes, Giant's P-TRX1 tubeless-compatible composite wheelset and a combination of SRAM X0 and X9 drivetrain components. The $450 price increase reflects those changes, which are worth the added investment. It's rare to see carbon wheels at this price point, and the 65 grams in weight savings is notable. The use of the 4-piston caliper Guide R brakes is also a step up from the Avid Elixir 7s. The guts of the Intrigue stayed the same, which is a good thing because Giant's Maestro suspension is a beast on the descents while still managing to pedal efficiently, particularly when the Fox Float CTD shock is set in 'Climb' mode. The Aluxx SL-grade aluminum frame felt plenty stiff and responsive. The Fox Float CTD Talas fork adjusted from 120 to 140 millimeters of travel, which came in handy on our out-and-back test course. It made sense to shorten the travel on the 3-mile climb, then stop, adjust the fork into the longer travel setting and rally back downhill. The Talas option, however, might be less useful on undulating terrain. Giant, and thereby Liv, was one of the first major companies to commit fully to the 27.5-inch wheel size, and it works really well on this platform. The Intrigue is nimble in the technical sections and easy to corner, even with its longish 17.6-inch chainstays and a 44.4-inch wheelbase, and is equally as ambitious on the descents. We had questions about the new bikes before we even got our test rigs, so we sent out a few queries—the kind of things we thought you might be asking yourself when you're looking at this bike. Then we sent out another round of asks if any major questions or issues came up during testing. Here's the feedback we received from Giant Bicycles' global senior product marketing manager, Andrew Juskaitis. VERNON FELTON: Plenty of companies offer women's-specific bikes that are fundamentally the same as the men's models, but feature different paint jobs and cockpit components. Giant takes a different approach with the Intrigue. Why? ANDREW JUSKAITIS: Because we truly are "giant," we have the ability to make investments into tooling expenditures that very few brands can truly compete against. With the official splitting of the brands for 2015 (Giant and Liv) we wanted to give a good deal of autonomy to the Liv product crew to produce the exact product they felt was right for their female audience. This meant truly women's specific geometry. VF: How does the distinct geometry actually benefit female riders? AJ: The Intrigue has a slightly taller front end (via the headtube) and shorter toptube than the Trance and this helps accommodate the "typical" female body proportions (of shorter torso, longer legs). To make the Intrigue a touch more easy to handle (more steering responsive) the category manager also chose to steepen the head angle a full degree over the "men's" Trance 27.5. VF: Which components on the Intrigue 1 are designed with women in mind? Do the fork and shock receive, for instance, a different tune geared towards lighter riders? AJ: The handlebars and saddle are female-specific designs, while both the fork and shock receive custom factory [i.e. lighter] compression and rebound settings (to accommodate the lower air pressures females tend to run). You'll also notice slightly lower gearing (22/36 chainrings over the Trance's 24/38 set up). Those choices were all made to make Intrigue more accommodating to the serious trail-riding woman. VF: One of the few criticisms our testers had of the bike centered on what it lacked—namely a carbon frame. They noted that the Liv Lust Advanced 2 has a lower price tag, but sports a carbon front triangle and were wondering, "Why did Giant decide to give this bike an aluminum front triangle?"